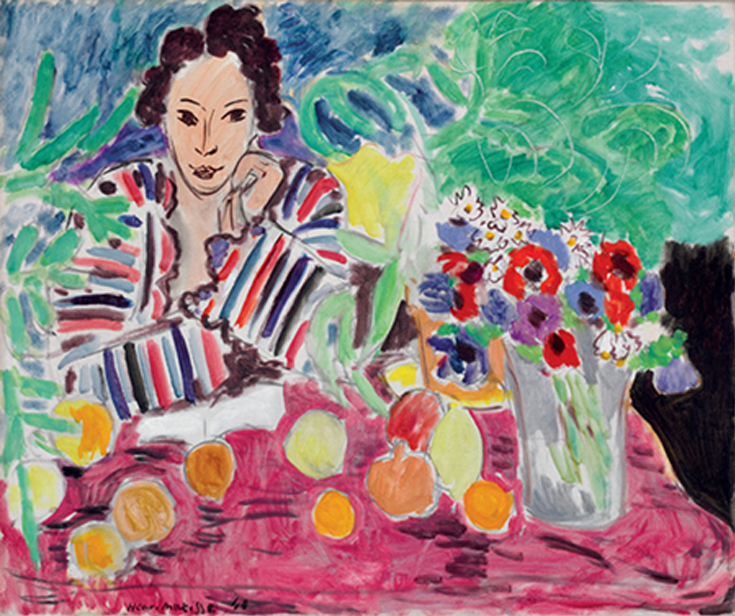 Henri Matisse, Striped Robe, Fruit, and Anemones, 1940. Oil on canvas, 21 5/8 x 25 5/8 inches (54.9 x 65.1 cm). The Baltimore Museum of Art: The Cone Collection, formed by Dr. Claribel Cone and Miss Etta Cone of Baltimore, Maryland, BMA 1950.263. © 2012 Succession H. Matisse / Artists Rights Society (ARS), New York. Henri Matisse fondly called Dr. Claribel and Miss Etta Cone “my two Baltimore ladies.” The two Cone sisters began buying art directly out of the Parisian studios of avant-garde artists in 1905. At a time when critics disparaged Matisse, and Pablo Picasso was virtually unknown, the Cones followed their passions and amassed one of the world’s greatest art collections. The exhibition tells this story and features more than 50 of these masterpieces–including paintings, sculptures and works on paper by Matisse, Picasso, Gauguin, Renoir, van Gogh, Pissarro, Courbet and more–on loan from The Baltimore Museum of Art. In addition to modern masterpieces, the exhibition includes textiles and decorative arts from Europe, Asia and Africa that the Cones collected, as well as photographs and archival materials to highlight the remarkable lives of these sisters. Also featured in the exhibition will be an interactive virtual tour of their adjoining Baltimore apartments, showing their remarkable collection as it was displayed in their home. All works are from the collection of The Baltimore Museum of Art: The Cone Collection, formed by Dr. Claribel Cone and Miss Etta Cone of Baltimore, Maryland. Tune in to UNC-TV for a new art documentary, Collecting Matisse and Modern Masters. See the full schedule of airtimes. Watch the documentary online. North Carolina's public television network filmed this documentary in HDTV at the Nasher Museum, telling the story of the Cone sisters and their special connection to North Carolina. Executive Producer Scott Davis treats us to a sensitive, up-close view of masterpiece paintings, plus Picasso's drawings and the Cone sisters' amazing collection of lace, textiles, jewelry and more.